SAVE 20% on Adesso. Cannot be combined with any other offer or discount, including Pro pricing. Excludes clearance, closeout, replacements, & parts. A modern twist on a coastal look, the Montauk Table Lamp is the perfect stand-out piece of décor for any room whether it is in your beach house or an industrial loft. Three matte black legs make up a classic tripod stance that provides stability in style. A metal wire cage is wrapped with rope, encasing a mood-setting vintage edison bulb which comes included with this purchase. 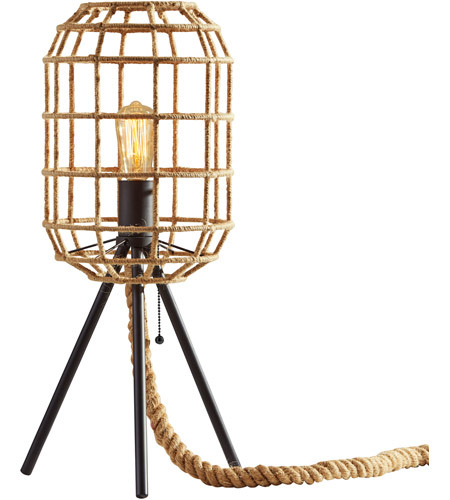 A thick, burlap rope cover turns the cord into a decorative addition to the lamp. Adesso is shaping the future of home design and we're driven by the simple idea that your home is a canvas. Adesso and our retail partners are here to help you create a masterpiece. Adesso was established in 1994 based on the belief that there was an under-served niche among consumers who sought high-end, contemporary home products at moderate prices. Since then, Adesso has not only revolutionized the home industry with its innovative products, but also gained substantial recognition for its well-designed and well-priced lamps and RTA furniture, quickly establishing itself as an industry leader and consumer favorite. From the onset, when Adesso first introduced its lighting products, an array of colors and materials were utilized in the design, including metals, rice-paper, woven fabric, glass, resin, renewable bamboo wood and cork! It wasn't long before a new category of RTA furniture was added to the product line. Everything from tables, chairs, and pedestals to media and coat racks, and screens was included in this new assortment. The furniture was and remains fresh, contemporary and always reasonably priced. Our wide range of products allows us to cater to a variety of tastes to ensure you will always find the style you are looking for. Adesso's customers include furniture stores, specialty lifestyle stores, national chains, catalog retailers, as well as many smaller furniture and lighting stores in both the U.S. and abroad.